The Rheinwiesenlager were a group of 19 camps built in the Allied-occupied part of Germany by the U.S. Army to hold captured German soldiers at the close of the Second World War. Officially named Prisoner of War Temporary Enclosures (PWTE), they held between one and almost two million surrendered Wehrmacht personnel from April until September 1945. Bergen-Belsen[ˈbɛʁɡn̩.bɛlsn̩], or Belsen, was a Nazi concentration camp in what is today Lower Saxony in northern Germany, southwest of the town of Bergen near Celle. Originally established as a prisoner of war camp, in 1943, parts of it became a concentration camp. Initially this was an "exchange camp", where Jewish hostages were held with the intention of exchanging them for German prisoners of war held overseas. The camp was later expanded to accommodate Jews from other concentration camps. Raising the Flag on the Three-Country Cairn is a historic photograph taken on 27 April 1945, which was the last day of the Second World War in Finland. It depicts a Finnish Army patrol of Battle Group Loimu, Infantry Regiment 1, raising the Finnish flag on the three-country cairn between Norway, Sweden, and Finland to celebrate the last German troops withdrawing from Finland. The photograph was taken by the commander of Infantry Regiment 1, Colonel Väinö Oinonen. It became a widely circulated symbol of World War II in Finland. Hitler's death: On 30 April, as the Battle of Nuremberg and the Battle of Hamburg ended with American and British occupation, in addition to the Battle of Berlin raging above him with the Soviets surrounding the city, along with his escape route cut off by the Americans, realizing that all was lost and not wishing to suffer Mussolini's fate, German dictator Adolf Hitler committed suicide in his Führerbunker along with Eva Braun, his long-term partner whom he had married less than 40 hours before their joint suicide. In his will, Hitler dismissed Reichsmarschall Hermann Göring, his second-in-command and Interior minister Heinrich Himmler after each of them separately tried to seize control of the crumbling Third Reich. Hitler appointed his successors as follows; Großadmiral Karl Dönitz as the new Reichspräsident ("President of Germany") and Joseph Goebbels as the new Reichskanzler (Chancellor of Germany). However, Goebbels committed suicide the following day, leaving Dönitz as the sole leader of Germany. The Battle of Nuremberg was a five-day battle between the forces of the United States 7th Army on one side, and Nazi Germany and Russian Liberation Army volunteers on the other during World War II. The battle saw some of the fiercest urban combat during the war and it took four days for the United States to capture the city. The battle was a blow to Nazi Germany as Nuremberg was a center of the Nazi regime. Many rallies took place in the city and to lose the city to the Americans took a heavy toll on already low German morale. Even though American forces heavily outnumbered the German forces, it wasn't until 20 April, that the 7th Army took the city center. The battle devastated the city. The Battle of Hamburg was one of the last battles of World War II, where the remaining troops of the German 1st Parachute Army fought the British VIII Corps for the control of Hamburg, between 18 April and 3 May 1945. British troops were met with fierce resistance inside the city as Hamburg was the last significant remaining pocket of resistance in the north. Once the British had captured the city, they continued their advance north-east and sealed off the remnants of the 1st Parachute Army and Army Group Northwest in the Jutland peninsula. German forces in Berlin surrender: The Battle of Berlin ended on 2 May. On that date, General der Artillerie Helmuth Weidling, the commander of the Berlin Defense Area, unconditionally surrendered the city to General Vasily Chuikov of the Soviet army. On the same day the officers commanding the two armies of Army Group Vistula north of Berlin, (General Kurt von Tippelskirch, commander of the German 21st Army and General Hasso von Manteuffel, commander of Third Panzer Army), surrendered to the Western Allies. 2 May is also believed to have been the day when Hitler's deputy Martin Bormann died, from the account of Artur Axmann who saw Bormann's corpse in Berlin near the Lehrter Bahnhof railway station after encountering a Soviet Red Army patrol. Lehrter Bahnhof is close to where the remains of Bormann, confirmed as his by a DNA test in 1998,  were unearthed on 7 December 1972. German forces in North West Germany, Denmark, and the Netherlands surrender: On 4 May 1945, the British Field Marshal Bernard Montgomery took the unconditional military surrender at Lüneburg from Generaladmiral Hans-Georg von Friedeburg, and General Eberhard Kinzel, of all German forces "in Holland [sic], in northwest Germany including the Frisian Islands and Heligoland and all other islands, in Schleswig-Holstein, and in Denmark… includ[ing] all naval ships in these areas",   at the Timeloberg on Lüneburg Heath; an area between the cities of Hamburg, Hanover and Bremen. The number of German land, sea and air forces involved in this surrender amounted to 1,000,000 men. On 5 May, Großadmiral Dönitz ordered all U-boats to cease offensive operations and return to their bases. At 02:41 on the morning of 7 May, at SHAEF headquarters in Reims, France, the Chief-of-Staff of the German Armed Forces High Command, General Alfred Jodl, signed an unconditional surrender document for all German forces to the Allies, committing representatives of the German High Command to attend a definitive signing ceremony in Berlin. General Franz Böhme announced the unconditional surrender of German troops in Norway on 7 May. It included the phrase "All forces under German control to cease active operations at 2301 hours Central European Time on May 8, 1945." The next day, Field Marshal Wilhelm Keitel and other German OKW representatives travelled to Berlin, and shortly before midnight signed an amended and definitive document of unconditional surrender, explicitly surrendering to all the Allied forces in the presence of Marshal Georgi Zhukov and representatives of SHAEF. The signing ceremony took place in a former German Army Engineering School in the Berlin district of Karlshorst; it now houses the German-Russian Museum Berlin-Karlshorst. Treaty on the Final Settlement with Respect to Germany : Under the terms of this peace treaty, the Four Powers renounced all rights they formerly held in Germany, including Berlin. As a result, following the acts of official German reunification achieved on 3 October 1990 and which itself was enabled by the Treaty, Germany became fully sovereign on 15 March 1991. Under the terms of the Treaty, the Allies were allowed to keep troops in Berlin until the end of 1994 (articles 4 and 5). In accordance with the Treaty, occupying troops were withdrawn by that deadline. Karl Dönitz was a German admiral who played a major role in the naval history of World War II. Dönitz briefly succeeded Adolf Hitler as the head of state of Nazi Germany. Alfred Josef Ferdinand Jodl was a German general during World War II, who served as the Chief of the Operations Staff of the Armed Forces High Command. The Nero Decree was issued by Adolf Hitler on March 19, 1945 ordering the destruction of German infrastructure to prevent their use by Allied forces as they penetrated deep within Germany. It was officially titled Demolitions on Reich Territory Decree and has subsequently become known as the Nero Decree, after the Roman Emperor Nero, who supposedly engineered the Great Fire of Rome in 64 AD. The decree was deliberately disobeyed by Albert Speer. Ferdinand Schörner was a general and later Field Marshal in the Wehrmacht of Nazi Germany during World War II. He commanded several army groups and was the last Commander-in-chief of the German Army. Hans-Georg von Friedeburg was a German admiral, the deputy commander of the U-boat Forces of Nazi Germany and the last Commander-in-Chief of the Kriegsmarine. He was the only representative of the armed forces to be present at the signing of the German instruments of surrender in Luneburg Heath on 4 May 1945, in Reims on 7 May and in Berlin on 8 May 1945. Generaladmiral von Friedeburg committed suicide shortly afterwards, upon the dissolution of the Flensburg Government. The Flensburg Government, also known as the Flensburg Cabinet, the Dönitz Government, or the Schwerin von Krosigk Cabinet, was the short-lived government of Nazi Germany during a period of three weeks around the end of World War II in Europe. 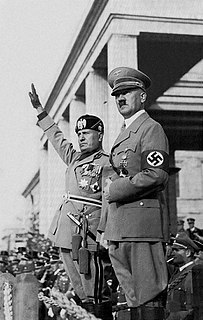 The government was formed following the suicide of Adolf Hitler on 30 April 1945 during the Battle of Berlin. It was headed by Grand Admiral Karl Dönitz as the Reichspräsident and Lutz Graf Schwerin von Krosigk as the Leading Minister. 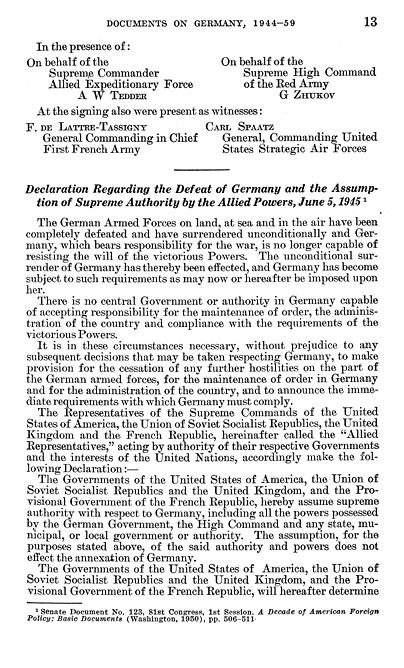 By the Berlin Declaration of 5 June 1945, the four governments of the United States, Soviet Union, United Kingdom and France, acting on behalf of the Allies of World War II, jointly assumed "supreme authority" over German territory and asserted the legitimacy of their joint determination of issues regarding its administration and boundaries, prior to the forthcoming Potsdam Conference. In Operation Doomsday, the British 1st Airborne Division acted as a police and military force during the Allied occupation of Norway in May 1945, immediately after the victory in Europe during the Second World War. The division maintained law and order until the arrival of the remainder of Force 134, the occupation force. During its time in Norway, the division was tasked with supervising the surrender of the German forces in Norway, as well as preventing the sabotage of vital military and civilian facilities. The Allied Control Council or Allied Control Authority, known in the German language as the Alliierter Kontrollrat and also referred to as the Four Powers, was the governing body of the Allied Occupation Zones in Germany and Austria after the end of World War II in Europe. The members were the Soviet Union, the United States, the United Kingdom, and France. The organization was based in Berlin-Schöneberg. 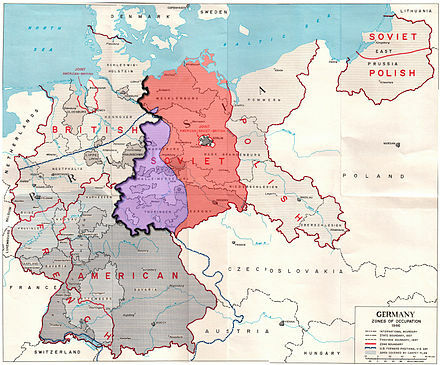 The council was convened to determine several plans for postwar Europe, including how to change borders and transfer populations in Eastern Europe and Germany. 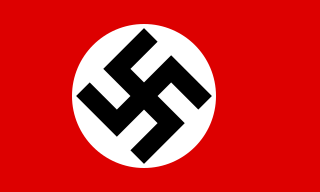 As the four Allied Powers had joined themselves into a condominium asserting 'supreme' power in Germany, the Allied Control Council was constituted the sole legal sovereign authority for Germany as a whole, replacing the extinct civil government of Nazi Germany. Regenbogen ("Rainbow") was the code name for the planned mass scuttling of the German U-boat fleet, to avoid surrender, at the end of World War II. The Alpine Fortress or Alpine Redoubt was the World War II national redoubt planned by Heinrich Himmler in November and December 1943 for Germany's government and armed forces to retreat to an area from "southern Bavaria across western Austria to northern Italy". The plan was never fully endorsed by Hitler and no serious attempt was made to put the plan into operation, although it would serve as an effective tool of propaganda and military deception by the Germans in the final stages of the war. On 4 May 1945 at Lüneburg Heath, east of Hamburg, Field Marshal Sir Bernard Law Montgomery accepted the unconditional surrender of the German forces in the Netherlands, northwest Germany including all islands, in Denmark and all naval ships in those areas. The surrender preceded the end of World War II in Europe and was signed in a carpeted tent at Montgomery's headquarters on the Timeloberg hill at Wendisch Evern. ↑ Kulju, Mika (2017). "Chpt. 4". Käsivarren sota – lasten ristiretki 1944–1945[The war in the Arm – children's crusade 1944–1945] (e-book) (in Finnish). Gummerus. ISBN 978-951-24-0770-5. ↑ Ernest F. Fisher Jr: United States Army in WWII, The Mediterranean - Cassino to the Alps. Page 524. ↑ Karacs, Imre (4 May 1998). "DNA test closes book on mystery of Martin Bormann". Independent. London. Retrieved 28 April 2010. 1 2 "The German Surrender Documents – WWII". Archived from the original on 17 May 2008. Retrieved 11 February 2005. ↑ Morgenthau, Henry (1944). "Suggested Post-Surrender Program for Germany [The original memorandum from 1944, signed by Morgenthau] (text and facsimile)". Box 31, Folder Germany: Jan.-Sept. 1944 (i297). Franklin D. Roosevelt Presidential Library and Museum (published 27 May 2004). Archived from the original on 31 May 2013. Demilitarization of Germany: It should be the aim of the Allied Forces to accomplish the complete demilitarization of Germany in the shortest possible period of time after surrender. This means completely disarming the German Army and people (including the removal or destruction of all war material), the total destruction of the whole German armament industry, and the removal or destruction of other key industries which are basic to military strength. ↑ US Code—Title 50 Appendix—War and National Defense Archived 6 July 2008 at the Wayback Machine , U.S. Government Printing Office Archived 29 April 2009 at the Wayback Machine .